Leave your everyday world behind and experience a four-day unforgettable fashion shopping escape like no other to New York City with your favorite family members or friends. Concierge-accompanied, first-class luxury excursions for four to six to NYC featuring exclusive visits to top designer showrooms, famed high-end retailers and boutiques; finest restaurants and premiere hotel accommodations, limousine service, Broadway show tickets, and much more. Introducing LetterLED Custom Design Series—the latest innovation in indoor signage! For the first time, you can customize LED indoor signage to better serve your customers. Available in four vibrant colors and three sizes, the Custom Design Series can be easily wall-mounted, hung from a window, or mounted on an easel—and installs in seconds! Today, LED is the cutting edge technology in illumination for signage. At PlastoLED, we’re committed to provide an exceptional array of quality LED products unsurpassed by any other manufacturer. By using PlastoLED top-quality, RGB color-changing technology with controller, you are assured to gain your customer’s confidence and satisfaction. The PlastoLED state-of-the-art, low-voltage DC power supplies comply with the industry’s highest electrical standards and energy conservation requirements. Plus, you will love our prices! 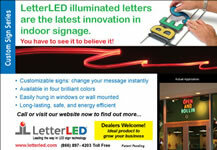 Headline: LetterLED illuminated letters are the latest innovation in indoor signage. LetterLED illuminated letters are the latest innovation in indoor signage.